Perhaps a little easy, but I'm feeling charitable. Size of image about ten centimetres across. Attribution, of course, to follow identification. Update: The identification post for this image (from Engel, 2005) is now available here. 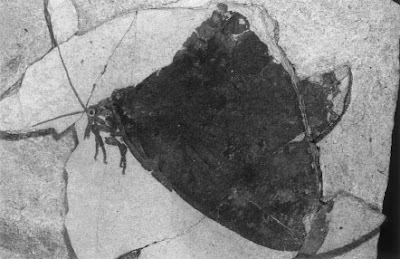 Its the giant butterfly-like lacewing Meioneurites spectabilis from the Jurassic of Kazakhstan, as anyone who has a copy of Grimaldi and Engel could easily find out. All hail Grimaldi & Engel! Lacewing was the second thing that crossed my mind, after a brief "moth....NOT moth!" moment. But I don't really work with dead stuff, and with my limited knowledge of zoology, couldn't be bothered to even try. In fact, I have no idea why this thing even reminded me of a lacewing - something about its head? I'm thoroughly ignorant about paleontology though. Like, nearly creationist level ignorant. (ok, maybe not that bad) Should probably fix that. I knew it was too easy. Pooh. Sorry for being off-topic, Chris, but have you checked palaeos.org lately? For a while, any attempt to visit it using Firefox 3.5.4 has given me a "Content Encoding Error: The page you are trying to view cannot be shown because it uses an invalid or unsupported form of compression." Internet Explorer 8 simply complains that it can't display the web page, with no other useful information. I'm not having trouble with any other web sites, including palaeos.com. Apologies if you've already explained this problem elsewhere. I've got no idea what happened to Palaeos.org, sorry. I haven't been able to see it for some time either. Is there anyone else I should contact? Yours was the first name that came to mind. Try Alan Kazlev. His contact details are on Palaeos.com. client: "I want this page; oh, BTW, I can handle gzipped responce"
server: "great, let me gzip it and send the result your way"
client: "bugger off; I don't know what you've sent, but gzip archives do not begin with whitespace"
Not a solution, of course, since that setting applies to *all* sites, not just palaeos.org. Thanks, Al, that did the trick. I've passed your explanation on to the person Alan said was in charge of the server, as well as cc'ing Alan.